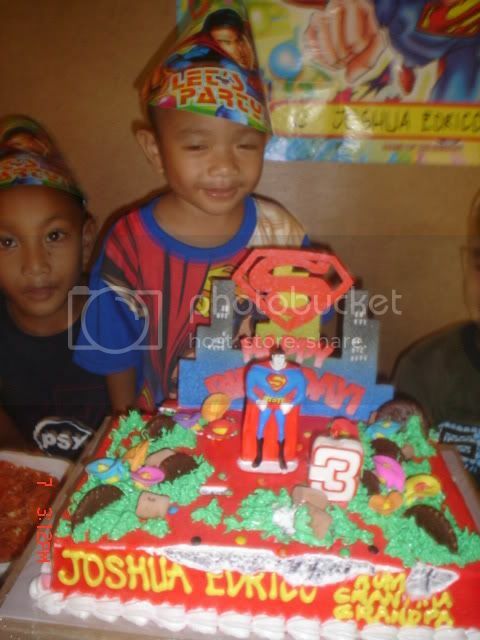 Ang Payag ni MamaGirl: Thank God, Birthday Party is Over! Thank God, Birthday Party is Over! After a week-long preparation, the birthday party is ovahhh! I didn't have enough time to plan, thanks to my full-time job - and my husband, he's not into planning his son's birthday bash - but the party went well! Of course, the theme is a no-brainer... ang walang kamatayang Superman! My cousin Raul took care of the food preparation, and my father sponsored the party balloons and the Superman cake... to the delight of my little boy. Look at his happy face! Little boy wore the Superman costume in the beginning, but had to be taken off as it was mainit (hot) that afternoon. He obliged but still wore a Superman shirt. Little boy's cousin, Beebop (left, the one carried by another girl who's a second cousin), was there to join the fun, and the second cousins as well. Kids, they all had fun popping the balloons and playing with the icing. The oldies enjoyed, too. They had their own drinking party. I'm glad we all survived and my house can now go back to normal! kita ang daku nga kalipay sang superman kid. enjoy gid xa sa birthday party ya.